this morning as i sipped my warm cup of coffee, i opened my reader and found a giveaway named "Vintage. Pearl. Cuteness" on Like A Warm Cup of Coffee. i love pearls. my wedding ring is a pearl. my favorite jewelry is anything with pearls. i love vintage. vintage is simple. 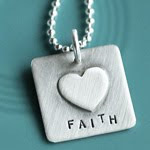 the vintage-looking hand-stamped jewelry with pearls is perfectly simple modern vintage. i am loving The Vintage Pearl. i love Sarah Mae. she doesn't know me from Adam, but i like to pretend we're really close friends. Sarah Mae is giving away a $50 gift certificate to The Vintage Pearl at Like A Warm Cup of Coffee. PS: Congratulations to Katy from www.PassionSpice.com! Katy was the one and only person to enter my HAPPYBABY book giveaway last week! Thank you for voting for HAPPYBABY in the Shine A Light contest. We really appreciate your support.